This barn wood dining table is made by hand using Old World craftsmanship techniques and no electricity. The Old Order Amish woodworker that handcrafts the table is off the grid and believes that his work is a gift from God. The barn wood is over 100 years old. This is truly a unique table that will likely be enjoyed for another century. 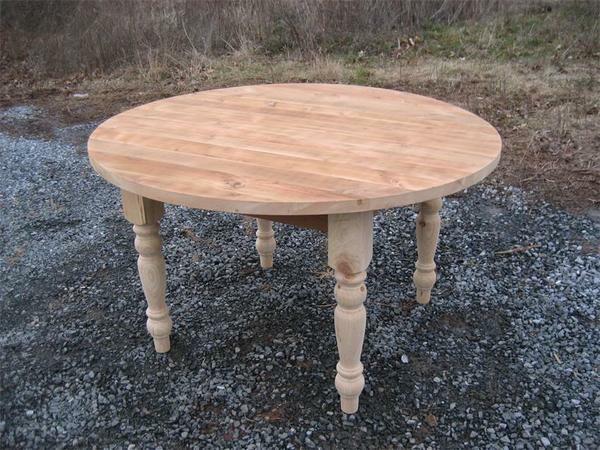 Customers need to realize that this dining table is made from reclaimed barn wood. There will likely be screw holes, nail holes, fine lines, indentations, small cracks and possibly paint in the grain. If these are not things that you are comfortable having in you table then you should consider one of our new wood tables such as rustic cherry wood or rustic oak wood. Nail holes or screw holes can be filled by selecting this option. If you need help selecting your table size, table finish or just want to chat about the table call one of our helpful sales associates at 1-866-272-6773. Check out our customer testimonial page to read what our happy customers have to say about DutchCrafters and their Amish furniture order. Finish choice ONLY available on legs and skirt. Table top finish depend on the finish that is already on the old wood.